As the time-honored art form of metal point drawing experiences a resurgence, Golden Artist Colors has responded to the requests of artists by introducing Silverpoint/Drawing Ground. Silverpoint (or metal point) drawing as an art form has changed little over the centuries of its distinguished history. The artist working in silverpoint today has an intimate connection to the work of such revered artists as da Vinci and Rembrandt, as well as more recently, Picasso and Joseph Stella. As tiny particles of metal are left behind on a slightly abrasive ground, metal point drawing offers the ability to achieve lasting, exquisitely detailed lines that won't smudge. If different types of metal are used within a piece, oxidation of the different metals will impart subtle shifts in the tonality of the lines over time. 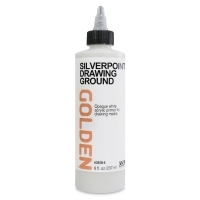 Formulated to meet the unique needs of metal point artists, Golden's Silverpoint/Drawing Ground offers a metal receptive ground, applicable to a range of drawing supports. A single coat of Silverpoint/Drawing Ground provides a smooth, durable surface, ideal for mark-making with a silverpoint stylus or other metals, such as brass, gold, copper, or even a steel paperclip. It can be brush-applied or spray-applied to paper, primed canvas, wood, or any surface that will accept a water-based coating. Designed for the achievement of fine, detailed lines, Silverpoint/Drawing Ground is permanent, lightfast, and more flexible over time than traditional preparations. Developed for easy application, it has a very fluid consistency that will level as it dries. Lastly, Silverpoint/Drawing Ground may be painted over with acrylic paints as well as applied onto already painted surfaces.